As Parragon Book Buddies we always look forward to receiving our latest book in the post. I especially like to see what we are getting as I don't know which child it will suit more. 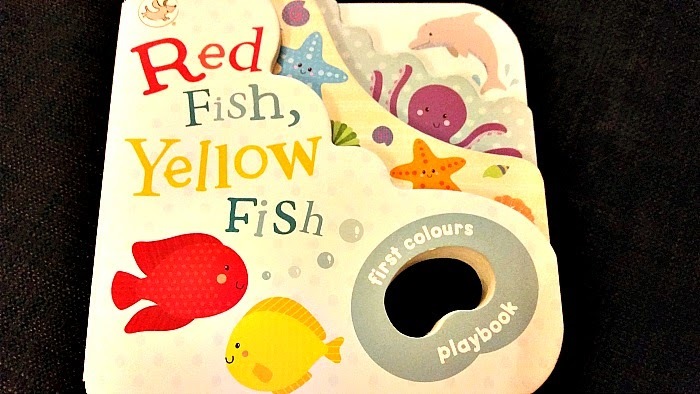 We recently received a fab little board book called 'Red Fish, Yellow Fish', a simple first colours play book but amazingly interesting to all three children at the moment. 'Red Fish, Yellow Fish' is a fantastic book made from chunky board pages. It has a little hand sized hole in the bottom right corner to help little hands grip on to it. The words are really simple, it is no complicated story it is simply a few statements on each page. The illustrations are very important in this book as the words used are describing the pictures as you can see from this picture of inside the book. Elsie has really enjoyed playing with the book and looking at the bright illustrations inside. Gracie is 4 and has been using the book to attempt to read. It is great for helping them sound out words especially when they realise the words are the same as the pictures. Gracie has been reading this book almost daily to Elsie and it is lovely to see them bonding over it. We were sent the item featured as part of the Parragon Book Buddies review club. All opinions are my own.